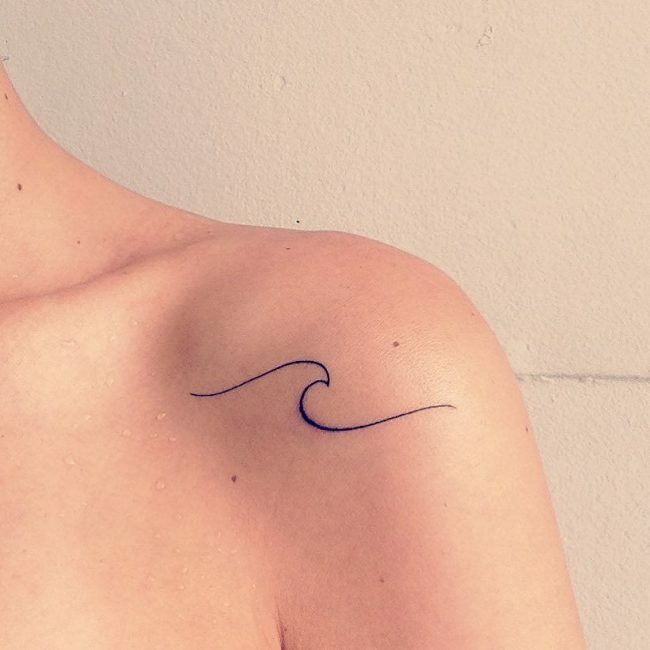 Wave tattoo designs are about as summer as it gets – aside from palm tree tattoos that is. The waves and the palm trees ultimately signify the season of summer. Imagine yourself lounging around the beach and hear the rustling waves and the billowing of the palm tree leaves against the wind. It is a relaxing vibe and atmosphere to behold! This is what the wave tattoo wants you to imagine whenever you see them. They want you to recall your last summer vacation and be in tune with the sea! 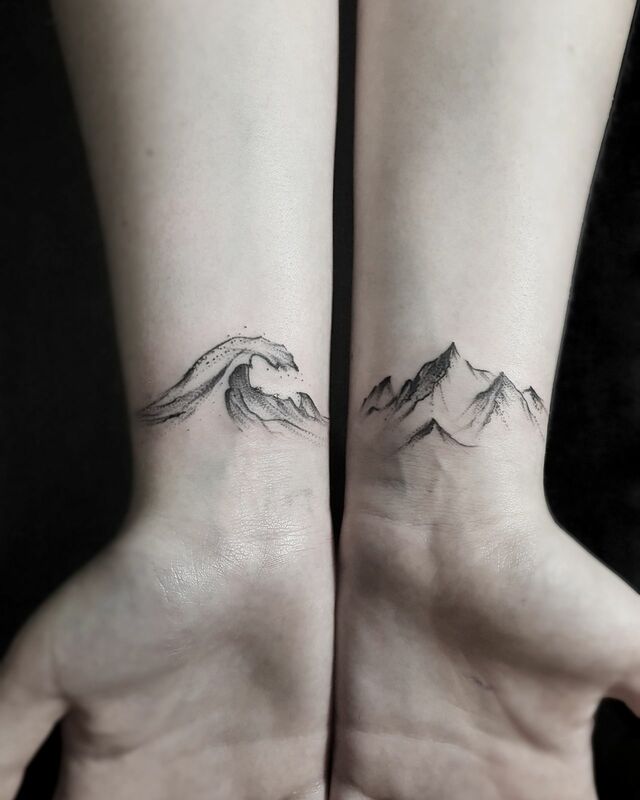 In this article, we will be sharing with you our rich and summer vibes gallery of wave tattoo designs. We will also share you the various designs you can do with the wave tattoo and the preferences of both men and women to this tattoo design. Waves are one of the strongest, most powerful, natural forces on earth. They’ve been known to swallow sailors as well as get them to their destinations. You may go against the currents but you’ll always get carried away by the waves. People who get wave tattoos strongly believe in making the most out of it and riding these waves instead. It could also mean his/her connection with the sea. A surfer, a sailor or just a sea lover. Keep your tattoo vibrant by using tattoo lotion. It helps in keeping the tattoo moisturized as you enjoy the sea and the sun. 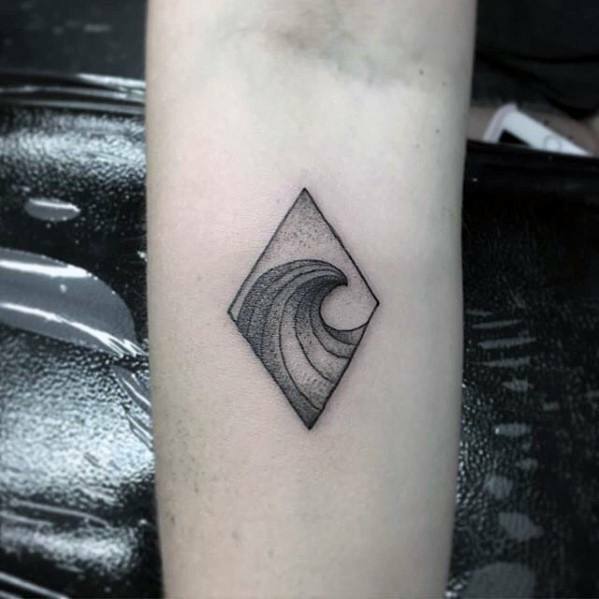 A wave may look like something very simple, but there are still many designs of this tattoo available. And so if you are thinking of having this tattoo you can be confident that you will have plenty of options. 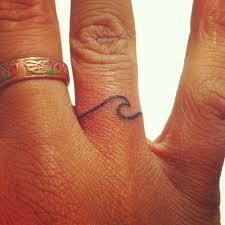 Waves tattoos are hugely popular and the first tattoos originated in pacific islander cultures. Back in the day, it was common to see simple single line designs. Tattoos have become much more detailed these days and that means there are some pretty cool designs available to you. There are so many options available to you today. Simple line tattoo designs are the most simple of the bunch but one of the most artistic designs you will see. You see, it is really hard for the wearer of the tattoo to rock something that is so simple. One may even pass it as a joke but the artistic implications of the design are just immense! 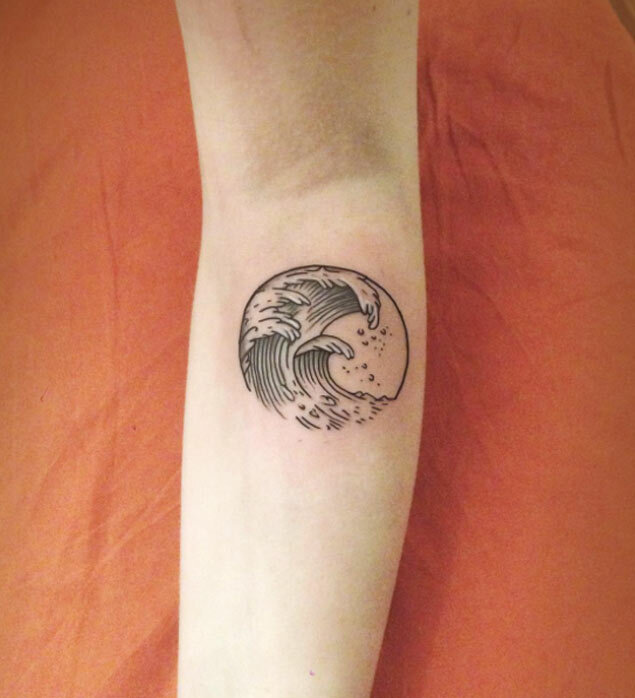 A thin three wave tattoo in simple line form. 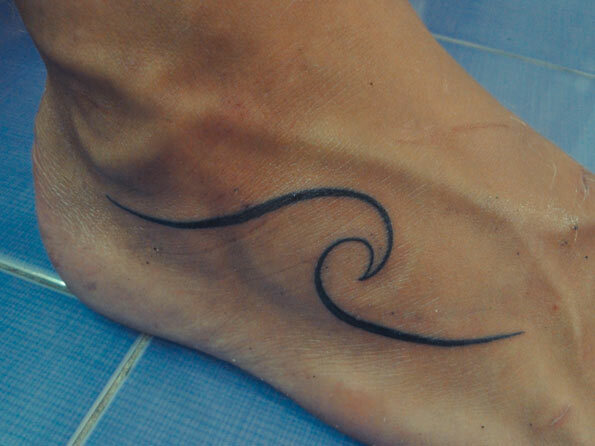 A simple line tattoo of a wave on the heel of the foot. 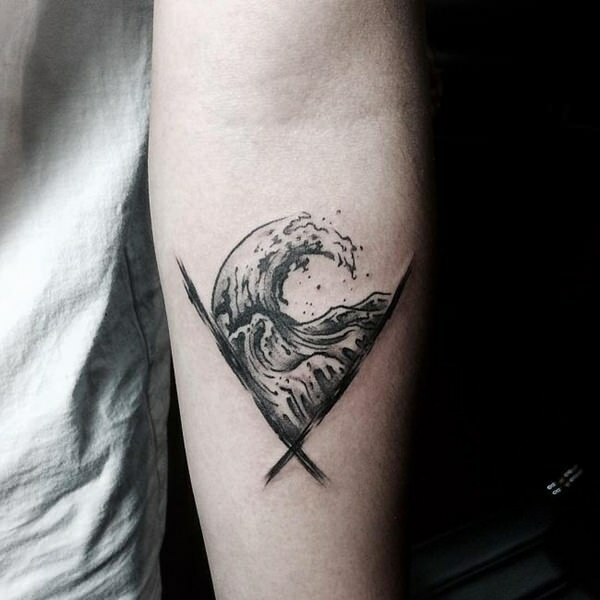 A simple line tattoo of a wave on the shoulder. 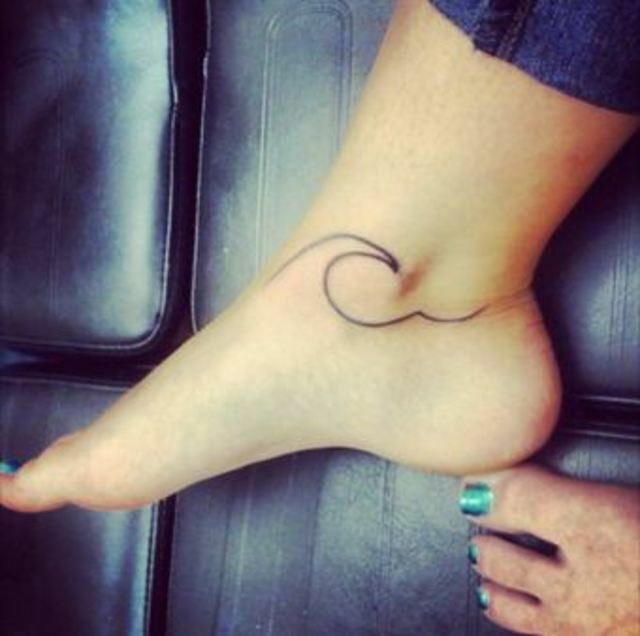 A curvy and thick simple line tattoo of a wave on the foot. 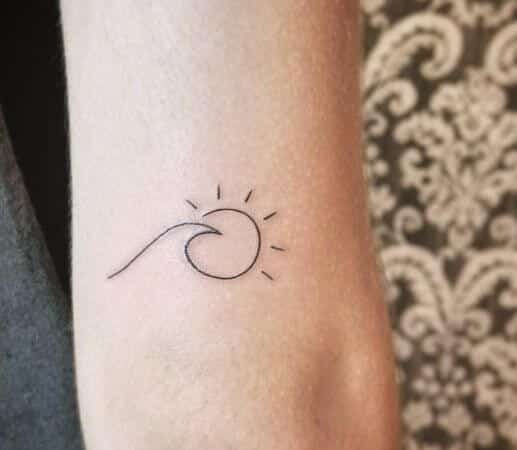 A simple line tattoo of a wave and the Sun. 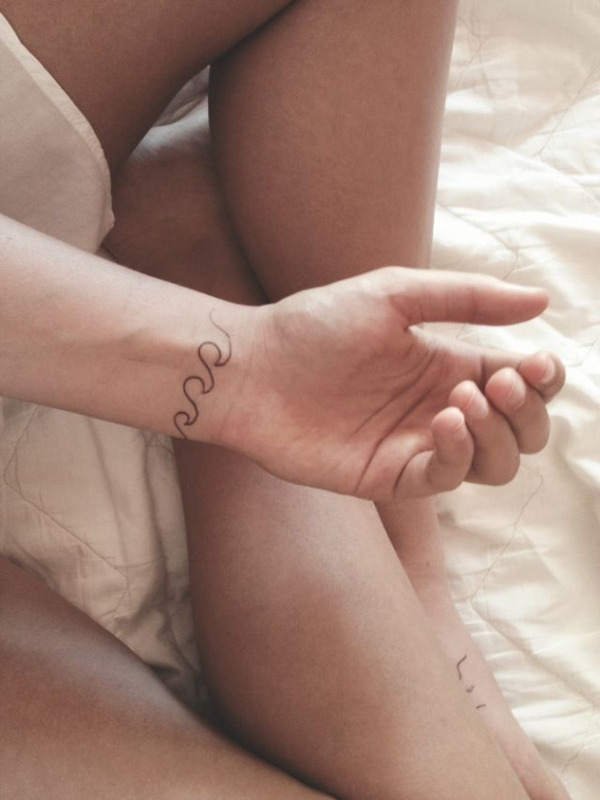 An artsy simple wave tattoo on the wrist. 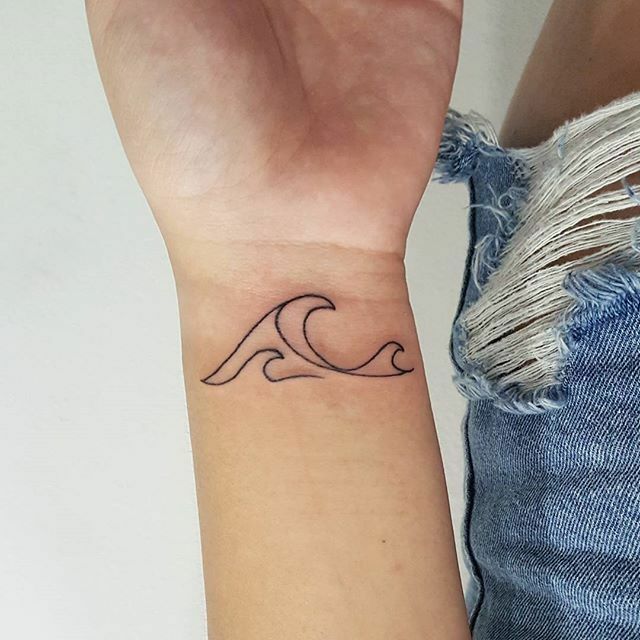 A small wrist tattoo of a wave in simple line form. 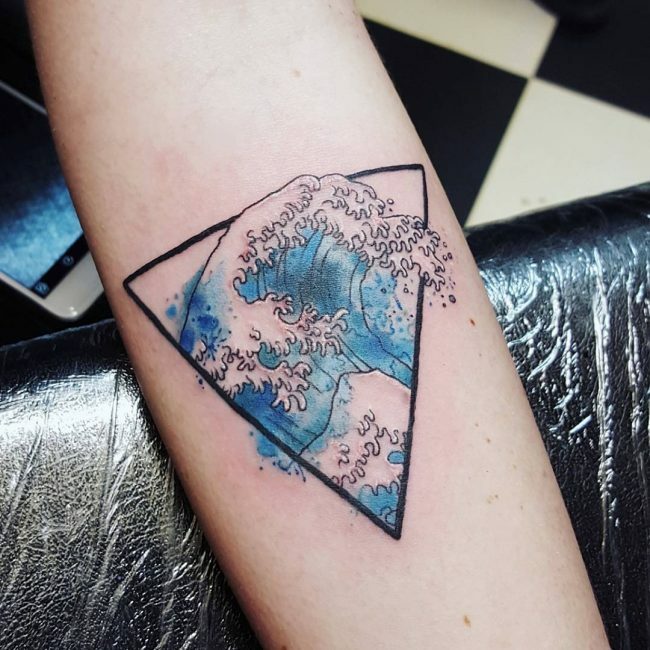 A fairly large simple line wave tattoo with a triangle. A small simple line wave tattoo on the finger. 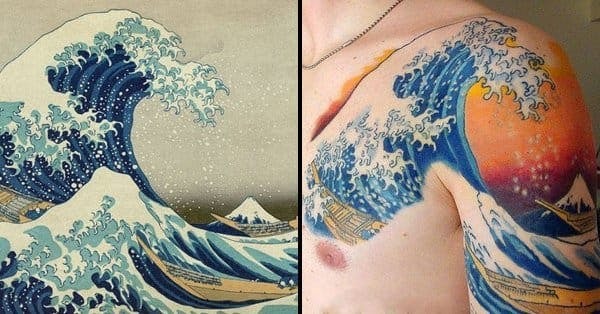 It comes to no surprise that the Japanese Wave Tattoo makes into this list. Nearly every Japanese tattoo is going to include water in some way. Waves are one of the most recognizable representations of water in the Japanese canon, and many of the artistic renderings by famous Japanese artists have reached global levels of recognizability. 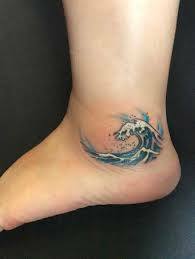 A blue Japanese wave tattoo on the leg. 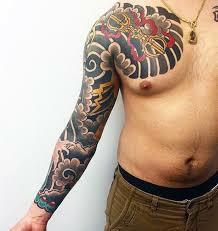 A large black ink tattoo of a full sleeve Japanese tattoo. 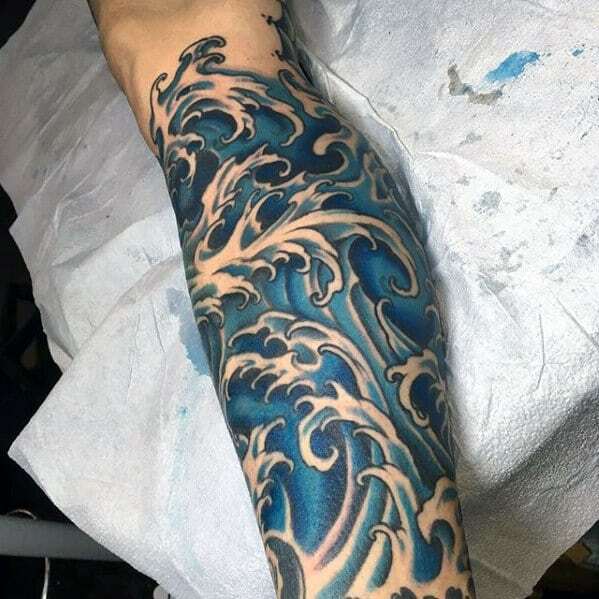 An upper sleeve tattoo of a blue Japanese wave. 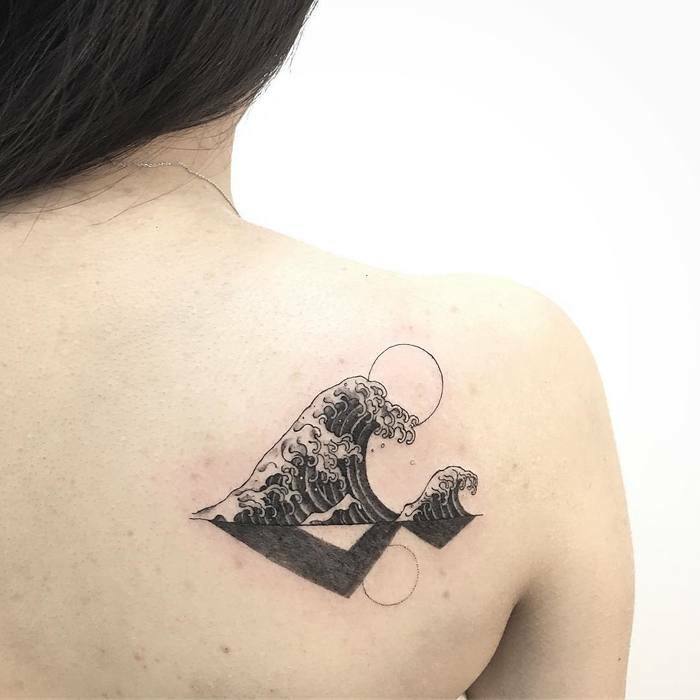 A black and white ink tattoo of a Japanese wave. 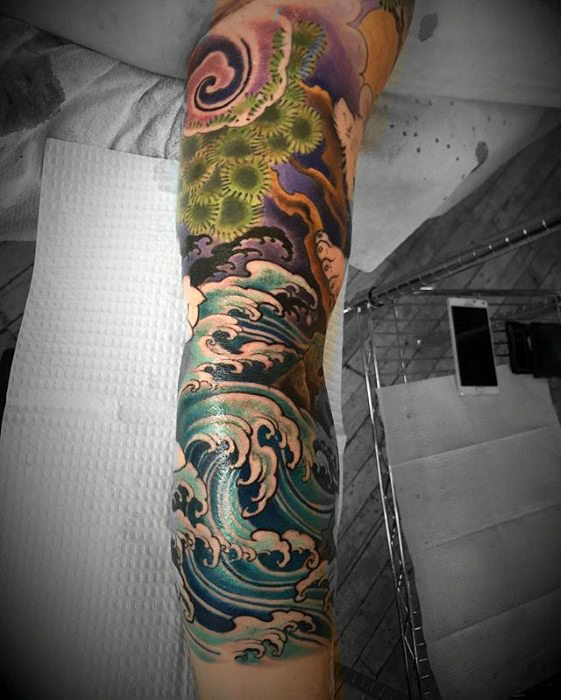 A vibrant and colorful full sleeve tattoo of Japanese waves. 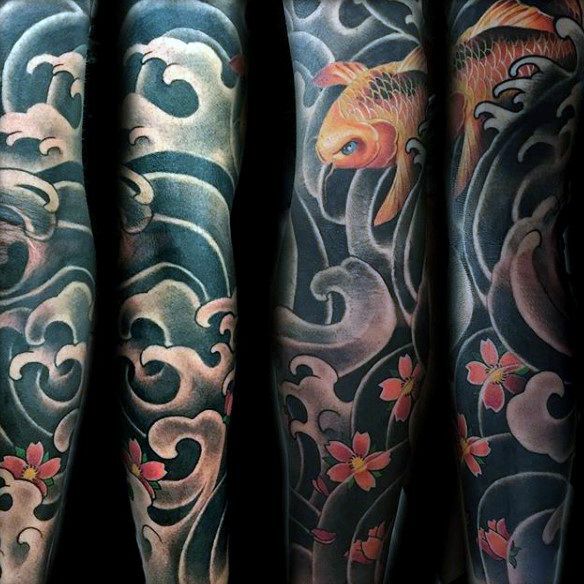 A large full sleeve tattoo of waves and a koi fish in japanese art style. 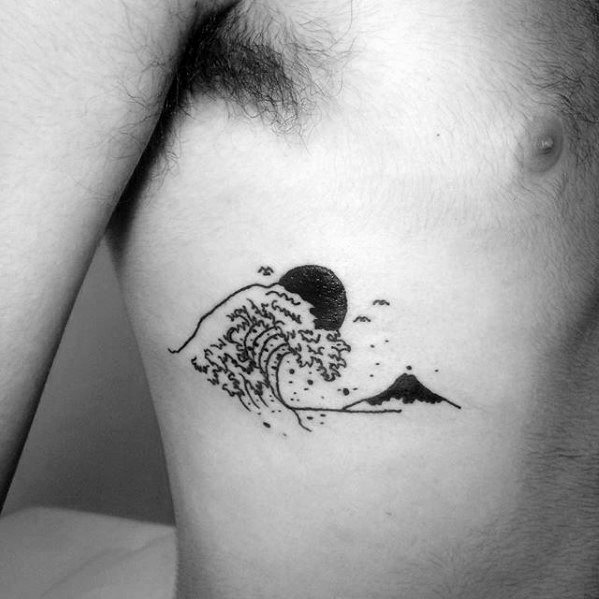 A large and intricate chest and upper sleeve tattoo of a japanese styled wave. 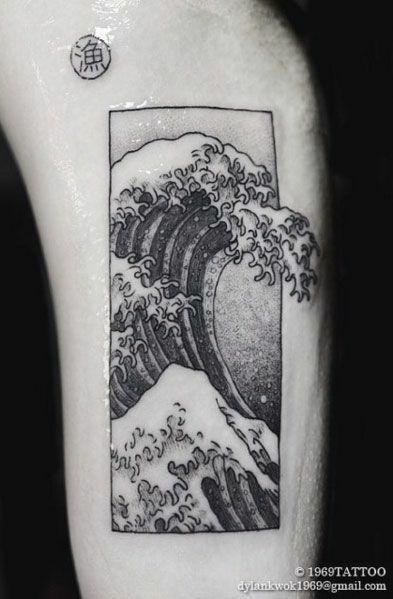 A forearm watercolor tattoo of a wave in japanese style. 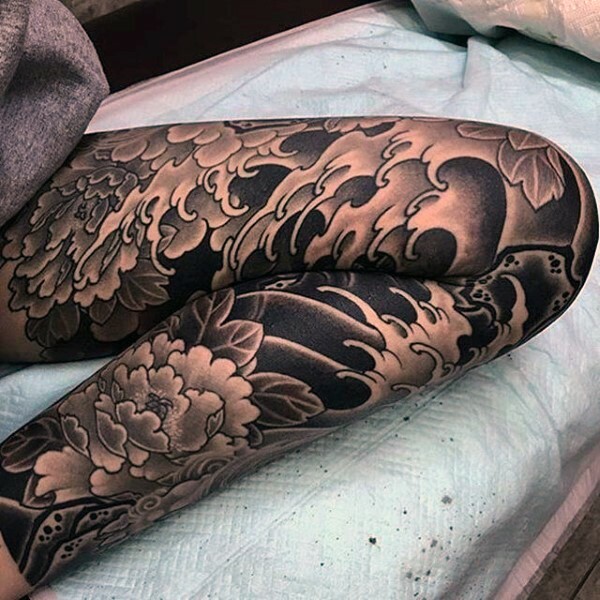 A large and intricate japanese wave tattoo on the leg. 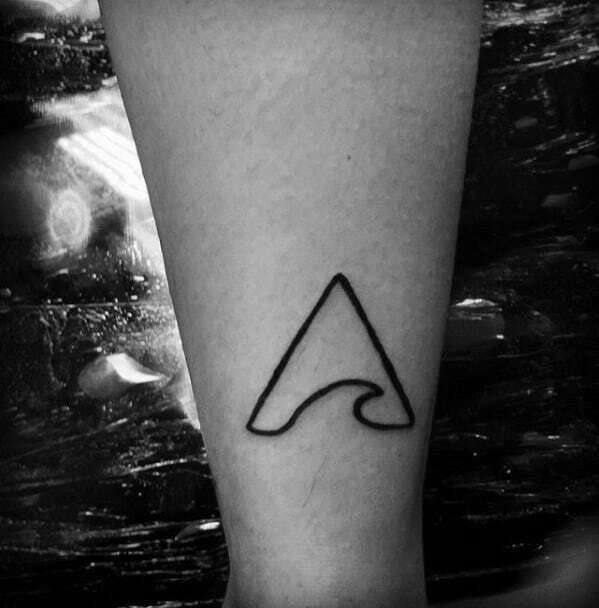 A wave tattoo framed by a triangle on the forearm. 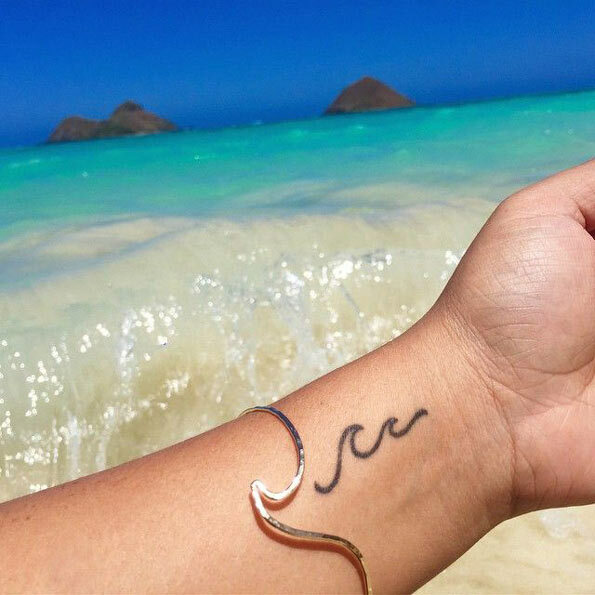 A diamond shape framed wave tattoo on the forearm. 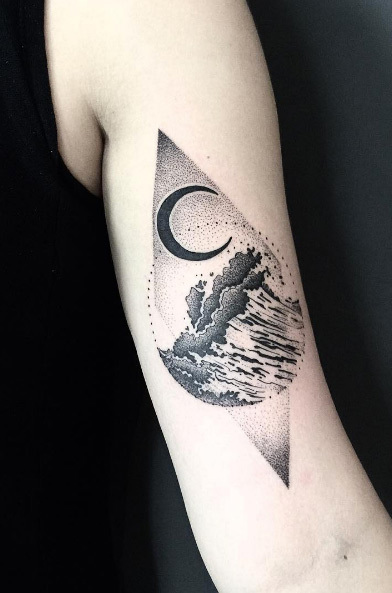 A fancy geometric wave tattoo on the upper sleeve. 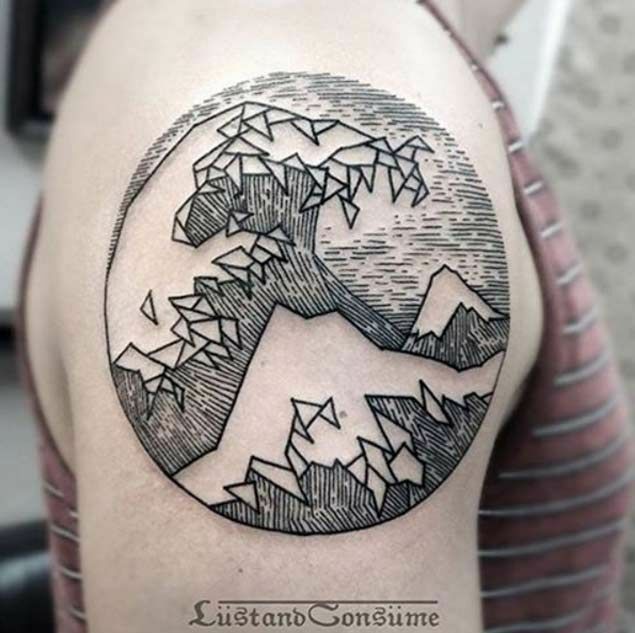 a low poly geometric tattoo of a wave on the forearm. Geometric wave tattoo on the upper sleeves. 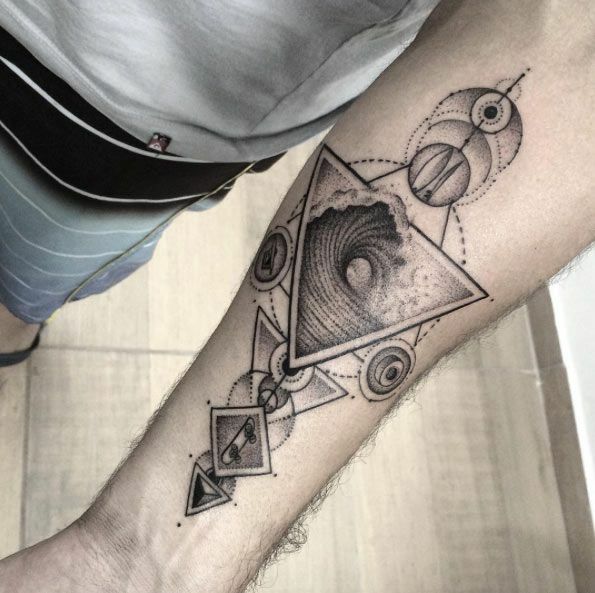 A very detailed geometric tattoo of a wave on the forearm. 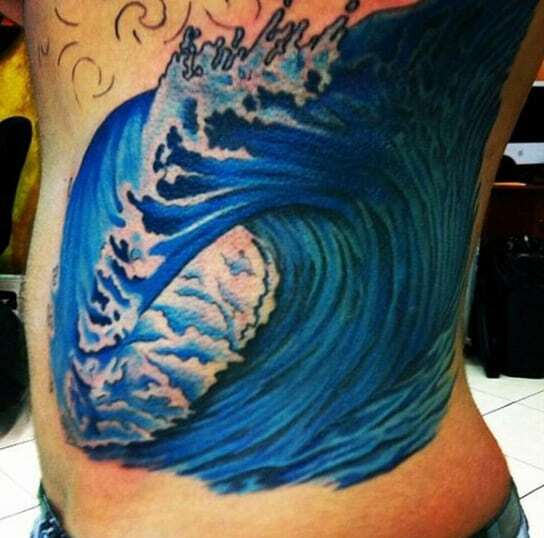 A very intricate and highly detailed geometric tattoo of a wave. 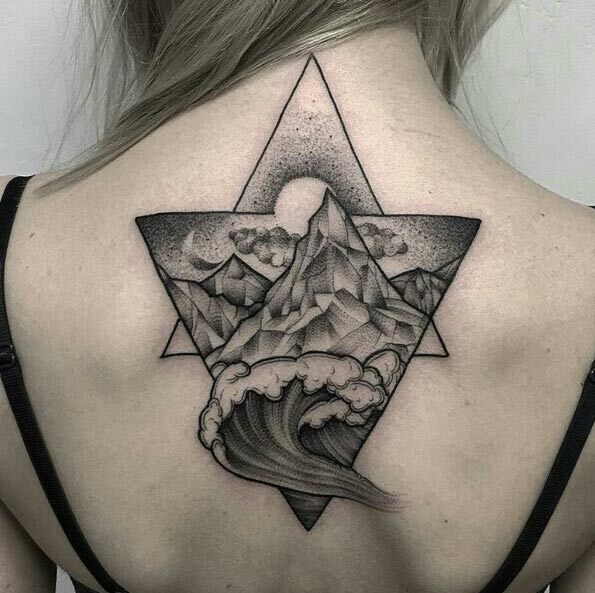 A fairly large and very intricate geometric wave tattoo on the upper back. 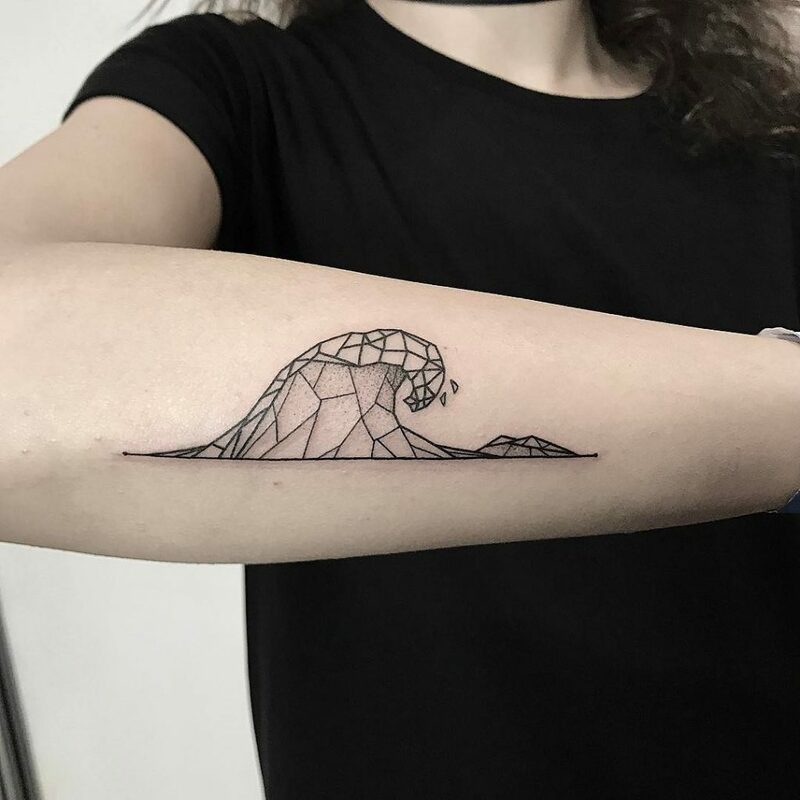 A geometric wave tattoo on the forearm. 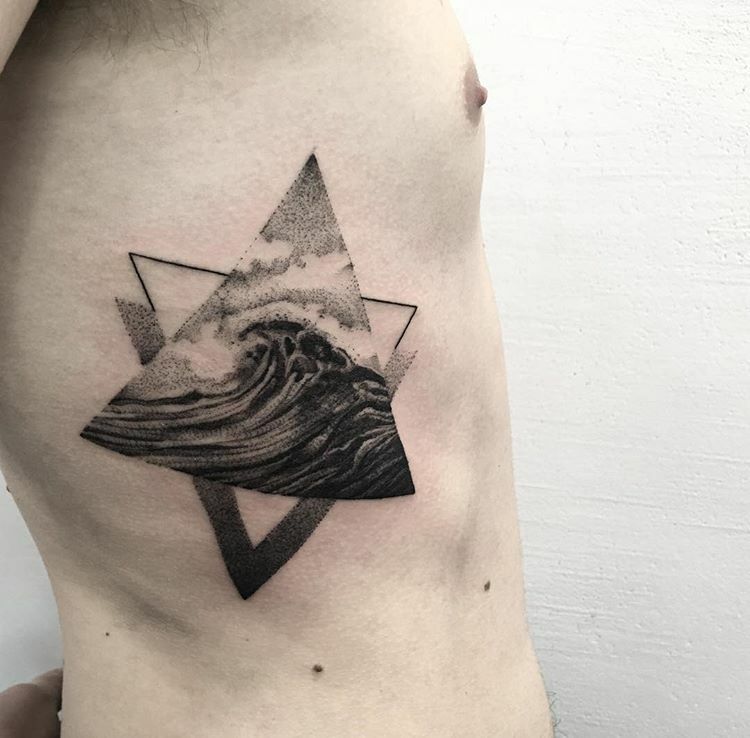 An upper back tattoo of waves with additional geometric tattoo detailing. Likewise, the tattoo designs that usually men choose are the one that is large and rich in intricate detail. It does not matter to them how long it will take the artist to make the design as long as it is very appealing to the eyes, its good enough for them. A non-colored japanese wave tattoo on the rib cage. 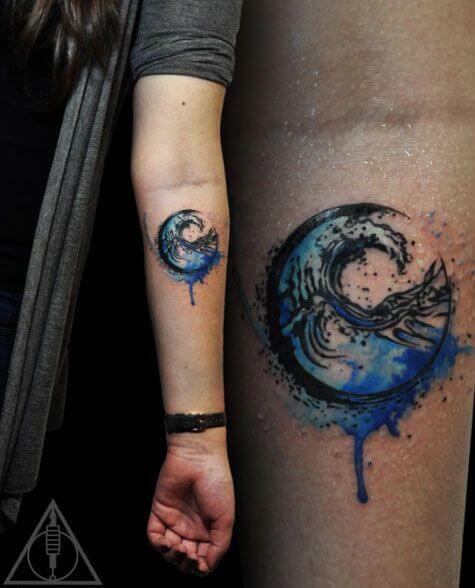 A small but intricate circular wave watercolor tattoo on the forearm. 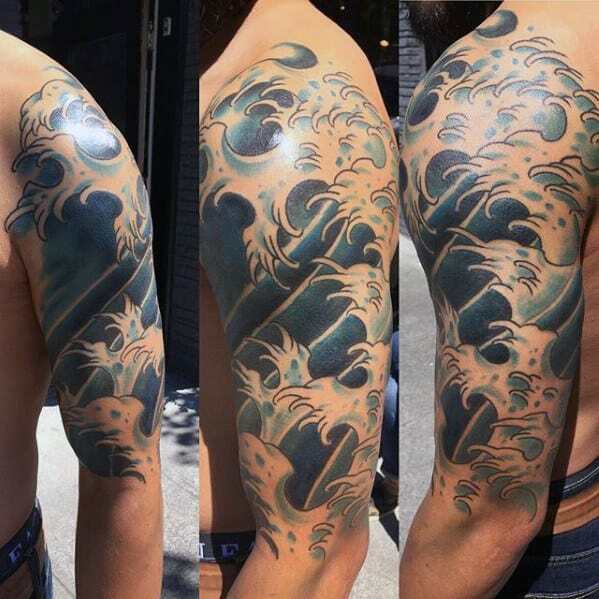 An intricate upper sleeves tattoo of waves. A large simple line tattoo of a wave on the back. A very detailed neotraditional tattoo of a wave on the sleeve and chest. A large full sleeve tattoo on the right arm. 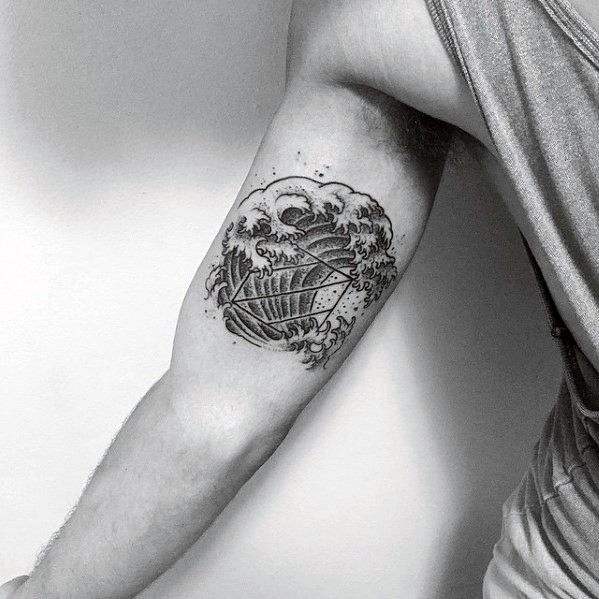 A fusion tattoo of a geometric and Japanese wave tattoo on the upper sleeves. 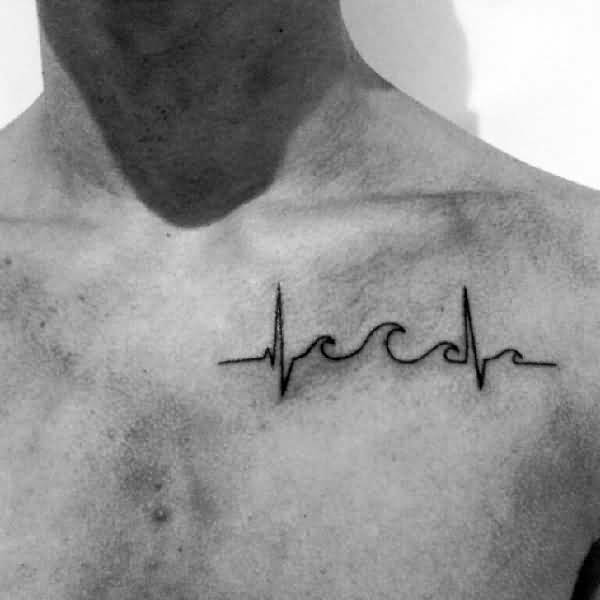 A simple line tattoo of a wave disguised as a heart line. 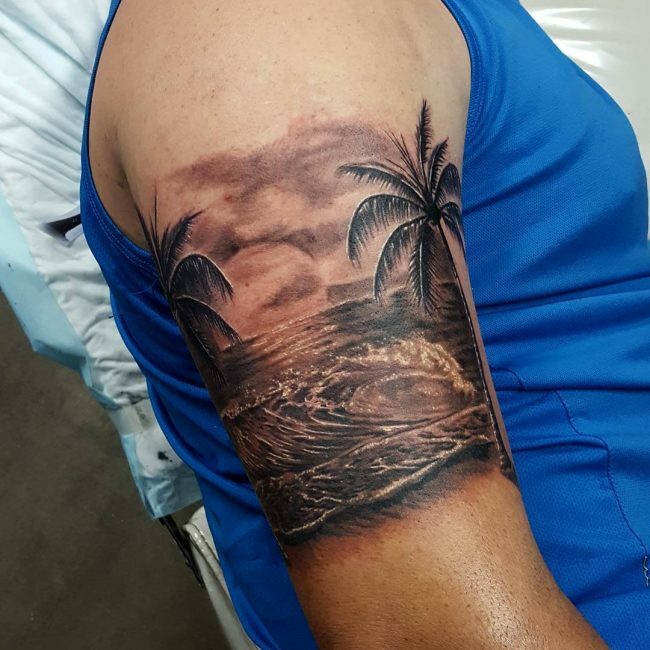 An upper sleeve tattoo of waves crashing into the beach. 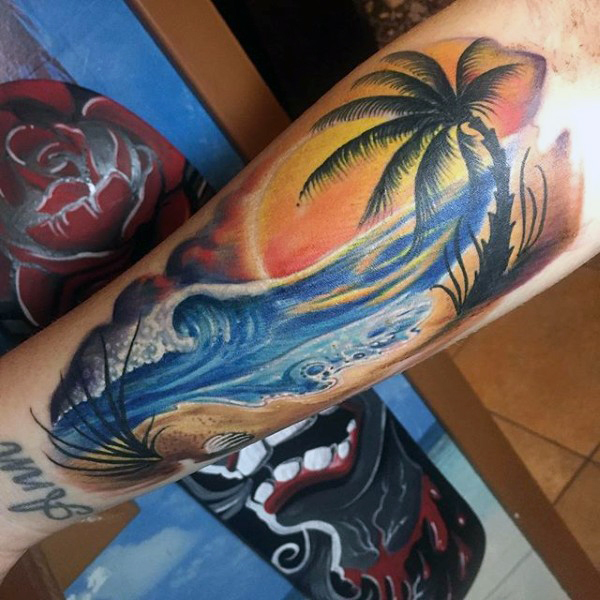 A very vibrant and intricate watercolor tattoo of a sunset with crashing waves. Women most of the time go with the simple but meaningful tattoo designs that will strike you to your very core. they want something simple so it can be easily concealed and is not that prominent in their sense of fashion. They almost always go with simplicity over complexity because of pain tolerance levels (some women might disagree with this) but some will also go with the equal balance of meaningfulness and aesthetic beauty. 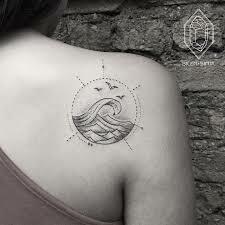 Here are some of the best wave tattoo for women that we think will be the most suited design for you! 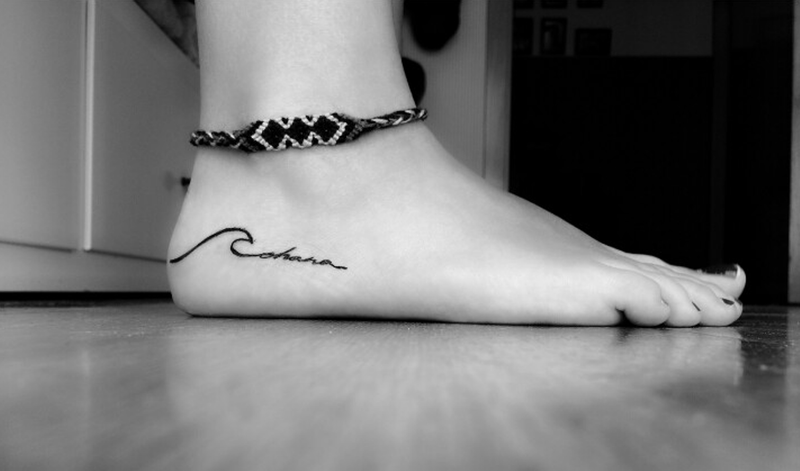 A simple line tattoo of a wave on the ankle. 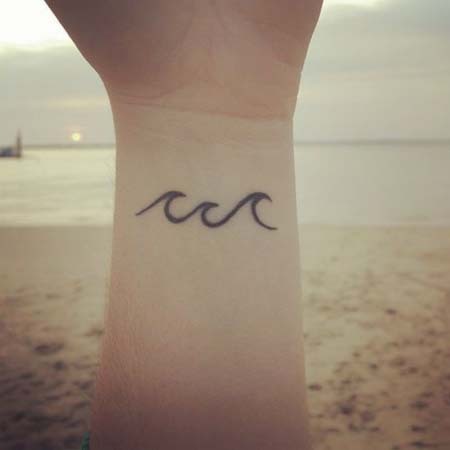 A small but intricate wave tattoo on the right wrist. 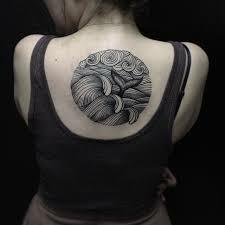 An upper back tattoo of a wave in a circle frame. A blue watercolor tattoo on the rib. 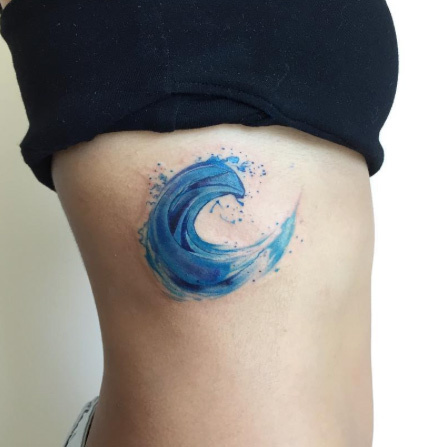 A large blue wave tattoo on the side. 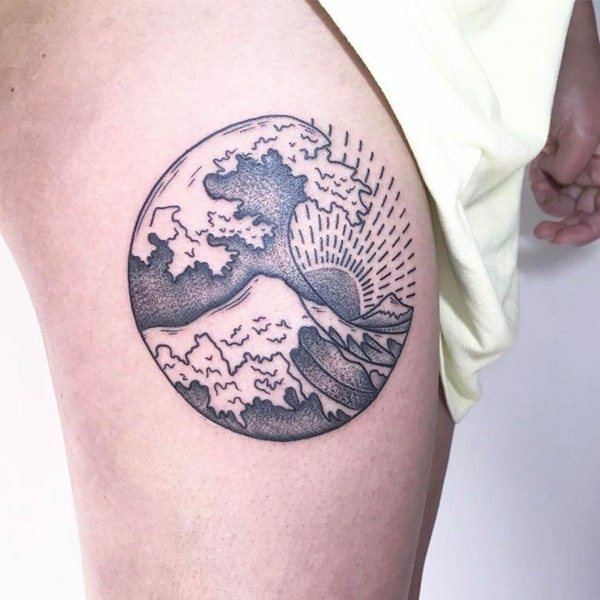 A highly detailed tattoo of a high wave on the thigh. A colored and intricately designed watercolor tattoo of a wave on the foot. 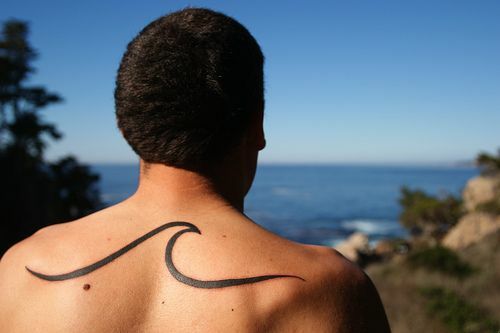 A large upper back tattoo of waves and a whale’s tail. 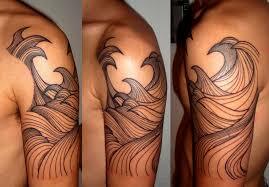 A medium size intricately designed wave tattoo on the forearm. A tribal themed wave tattoo on the side of the foot. Like water, the wave is very flexible. It can be placed anywhere in the body provided that there will be space for it. Most of the time, men and women prefer to place them on the upper sleeves and forearm portions if it is a visually striking design. 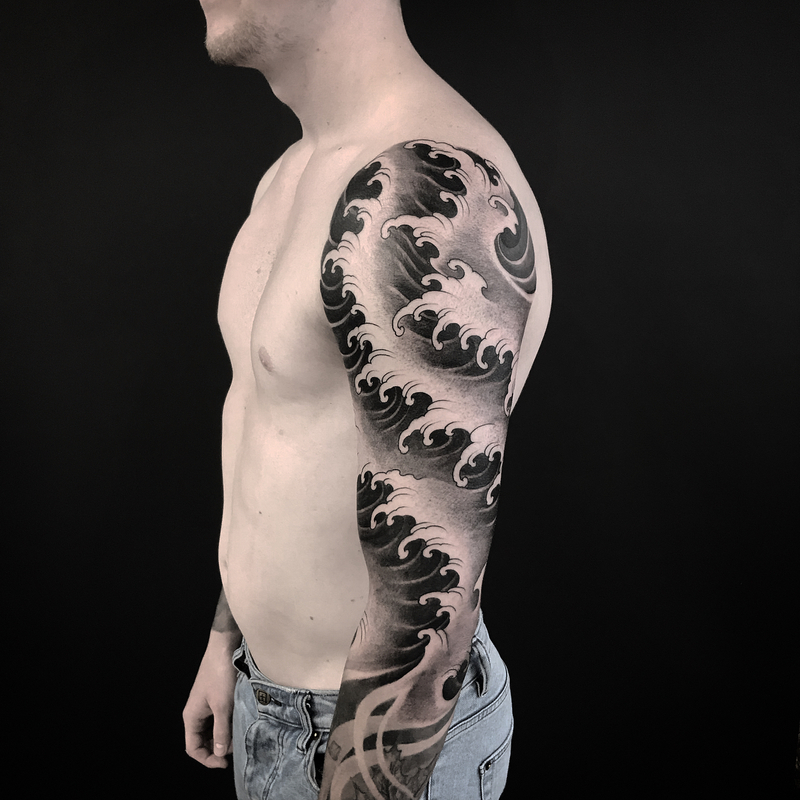 There are also a lot of tattoo enthusiasts in the tattoo community who would like to have a full sleeve and chest tattoo of the wave design if they decided to want to have a pattern-like design that is visually striking. 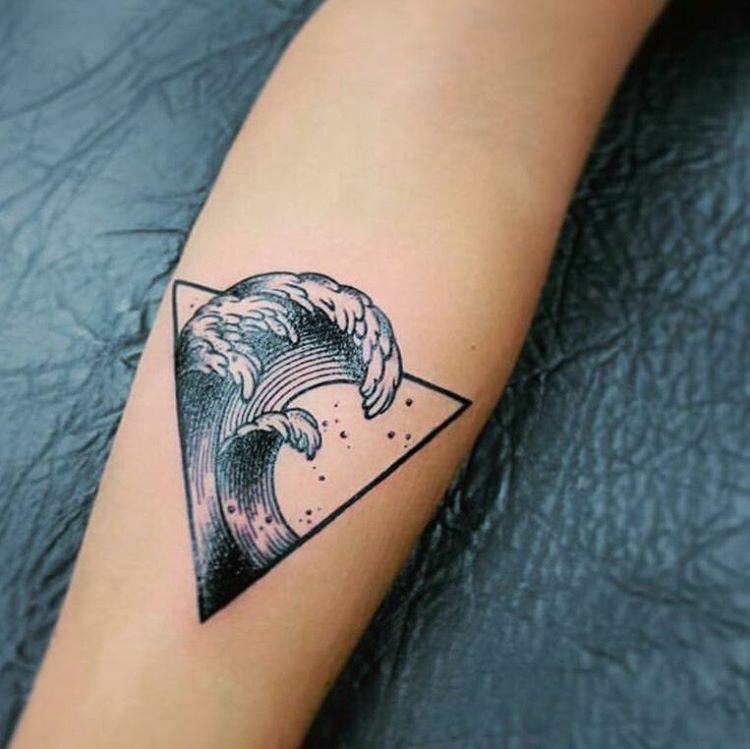 If you desire to have a simpler wave tattoo design that is full of meaning and artistic implication, the wrist, ankles, shoulders, and upper back are really ideal as a body placement since these places are very visible and at the same time can be concealable if demanded by circumstance.